You really don't enjoy shopping. For you, it's just another chore. You approach shopping systematically. You research what you're going to buy and come prepared with a list. 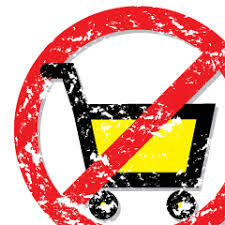 Of all the types, you are the most likely to not buy things you don't need. You try to de-emphasize stuff in your life. You find shopping and buying things to be a rather empty experience. Let me know if you take the quiz and what kind of shopper you are. I'm a reluctant shopper too. Just never liked it. I'm glad the test agreed with what I thought!